The importance of saffron in the growth of non-oil exports makes it necessary to explain proper marketing systems based on expert priorities. The aim of this study is to identify and prioritize marketing mix elements influencing the increase in export of this product. In this regard, based on McCarthy's 4P model, different criteria for export marketing of this product were determined and prioritized using Analytical Hierarchy Process and interviews with 63 experts in the export of saffron. Based on the findings, product criteria with important sub criteria such as brands, the standard sign and packaging weighting 0.485, have the highest priority in saffron marketing. Promotion criteria (weight 0.281) are the next important in determining the marketing mix. Among the indicators of this criterion, advertisements (0.408), overseas sales (0.23) and specialized exhibitions (0.138) were the determining factors in maintaining Iran`s share of this market. Finally, the criteria of price (weight 0.183) and distribution (0.068) have third and fourth priority in saffron marketing mix. Accordingly, identifying distribution channels in target markets, funding the establishment of an international distribution network for Iranian brands, supporting mechanized production process of saffron, and encouraging and requiring manufacturers to food-grade and health license are required and recommended. Aghaii, M., and Rezagholizadeh, M. 2011. Assessment of comparative advantage in the production of saffron. Economics and Agricultural Development 25 (1): 121-132. (In persian). Bamka, W.J. 2000. Using the internet as a farm-marketing tool. Journal of Extension 38 (2). Biria, S., and Jabal Ameli, F. 2006. The effective factors in exporting Pistachio, saffron and dates in Iran’s non-oil export commodities basket 1991-2001. Agricultural Economics and Development 54: 197-199. (In persian). Darijani,A., Shahhossein Dastjerdi, S., and Shahnoushi, N. 2011. Determination of drought risk management priorities in agricultural sector of Gonbad-e-Kavous district using AHP technique. Agricultural Economics 5 (1): 37-59. (In Persian with english summary). Iran Customs Administration. 2013. Agricultural statistics, Tehran. (In persian). Farahmand, K., Daneshvar Kakhki, M., Shahnoushi, N., Ghasemi, V., and Hemmati Kakhki, A. 2012. Factors affecting the development of the saffron market using Fuzzy Delphi method. Agricultural Economics 6: 97-119. (In persian). Feali, S., Pezeshkirad, Gh., Chizari, M., and Yaghoubi, A. 2009. Packaging industry and its role in saffron export. Journal of Agriculture and Natural Resource Construction Engineering 5 (20): 37-59. (In persian). Ghodsypour, H. 2000. Analytical Hierarchy process. Amirkabir university press, Tehran. (In Persian). Hosseini, S., and Ahou Ghalandari, M. 2007. Marketing margin analysis of Iranian saffron. In 06th National Conference of Agricultural, Mashhad, Iran, November 2007, p: 68-75. Karbasi, A., and Akbarzadeh, J. 2008. Estimation of supply and demand of Iranian saffron export using simultaneous equations. Agricultural Economics and Development 62: 95-106. (In persian). Karbasi, A., and Rastegaripour, F. 2014. Evaluation of comparative advantage on production and export of saffron. saffron agronomy and technology 2 (1): 59-74. (In Persian with english summary). Kotler, P., and Armstrong, G. 1989. Principles of Marketing. Global edition. Germany. Lopez. A.I., Resano-Ezcaray, H., and Camarena-Gómez, D.M. 2009. Developing marketing strategies for Jiloca saffron: a price hedonic model. Spanish Journal of Agricultural Research 7 (2): 305-314. Low, S.P., and Tan, M.C.S. 1995. A convergence of western marketing mix concepts and oriental strategic thinking. Marketing Intelligence & Planning 13 (2): 36-46. Mac Carthy, E.J. 1964. Basic marketing, IL: Richard D. Irwin. Masoomzadeh Zavareh, A., Ebrahimi, A., Shamsi, J., and Dehnavi, K. 2013. Operational plan of Iran saffron’s branding. Saffron Agronomy& Technology 1 (2): 39-68. (In Persian with english summary). Moghaddasi, R., and Alishahi, M. 2007. Study on the determinants of Iran's share in world agricultural markets. Journal of Agricultural Sciences 13 (1): 21-37. (In Persian with english summary). Mousavi, N., Yazdani, S., and Rezaei, M.R. 2009. Effects of globalization on agricultural exports: a case of Saffron. Agricultural Econoimcs Research 1 (2): 43-60. (In persian). Paseban, F. 2006. Investigate factors affecting the export of Iranian saffron. Iranian Journal of Economic Research 6 (2): 56-64. (In Persian). Pezeshkirad, Gh., and Feali, S. 2010. Challenges and solutions for the processing, marketing and export of saffron: application of delphi method. Agricultural Economics 4 (1): 137-157. (In Persian with english summary). Rezaie Gashti, S., Heidary Rad, M., and Sohrabi Fard, S. 2013. Study of factors affecting the export and its legal barriers. International Research Journal of Applied and Basic Sciences 4 (7): 1872-1875. Saaty, T., and Peniwati, K. 2008. Group decision making: drawing out and reconciling differences. Pittsburgh, Pennsylvania: RWS Publications. Sadeghi, S., Khodaverdizadeh, S., and Khodaverdizadeh, M. 2011. Determination of comparative advantage and market structure of global import and export of saffron. Research in agricultural economics 3 (3): 88-94. (In persian). Shahvali, M., Fatemi, M., and Malekian, A. 2012. 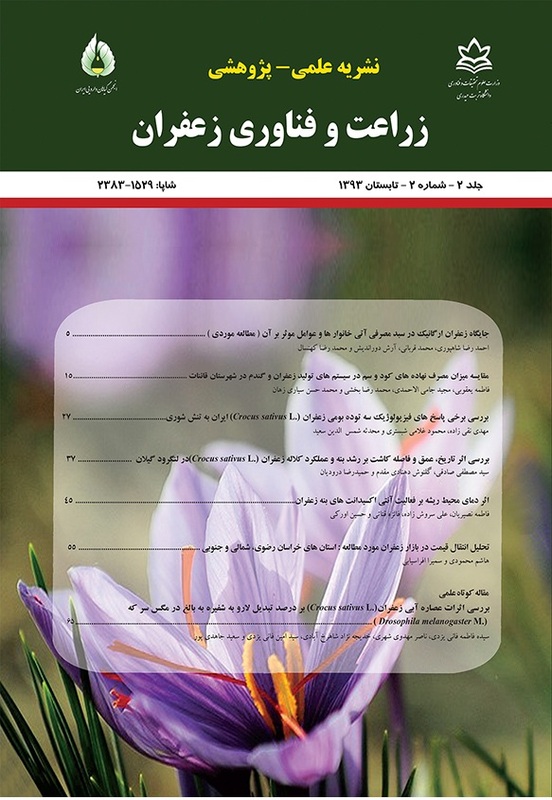 Design optimization of communication and information for saffron farmers marketing of Estahban city, Fars province. Spatial Planning 17 (1). Shahroudi, A., firouzaie, A., and chizari, M. 2007. Structures that affect performance and quality of saffron: case study of Torbat-e Heydarieh. Iranian Agricultural Extension and Education Journal 3 (1): 143-157. (In persian). Toledo, R., Engler, A., and Ahumada,V. 2011.Evaluationof risk factors in agriculture: Anapplication of the analytical hierarchical process (AHP) methodology. Chilean journal of Agricultural research 71 (1): 114-121. Torkamani, J. 2000. Economic analysis of production and marketing of Iranian saffron. Soil and Water Science (Science and Technology of agriculture and natural resource). 4 (3): 29-44. (In persian). Vignali, C., and Davies, B.J. 1994. The marketing mix redefined and mapped - Introducing the MIXMAP model. Management Decision 32 (8): 11-16.